Basic products such as T-shirts and blue jeans are sold for years with few style changes. Apparel and other consumer products have different length of life cycles. Businesses selling basic products can count on a long product life cycle with the same customers buying multiple units of the same product at once or over time. Fashion products have shorter life cycles than basic products. For example: A particular fashion hits the market and people start buying that product. When some new fashion comes, people shift to that one while abandoning the first one. Fashion products after sometime, reach highest sale point and then a saturation point after which they decline. The fad has the shortest life cycle. It is typically a style that is adopted by a particular sub-culture or younger demographic group for a short period of time. For example: When a new fad breaks, say following IPL, many fans will wear the T shirts with the team logo until the game gets over. Where fashion is concerned, take example of Indian celebrity Salman Khan’s Being Human Line, where people will buy T shirts right, forth and centre with the logo written in simple style in front. This is a fashion that will soon reach masses and then saturation point asking them to introduce some other style. The overall sales of basic products are the highest of the three types of products, and their life cycles are generally the longest. For example: Levis jeans, whose particular style may go on and on. 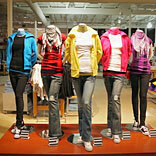 Apparel products often have a fashion dimension, even if it is just colour. As fashion features increase in a product, the life cycle will decrease. Therefore, if you are designing a fashion product, you will want to have multiple products in line for introduction as each fashion product's cycle runs its course. Some firms build their lines to include basic, fashion, and fad products in order to maximize sales. Some may have four styles that have classic styling and colours and are always in the line. Four additional styles may be modified every two years to include silhouette, length, and collar changes based on the current fashion. One or two short-cycle fashion or fad styles based on breaking trends may be introduced once or twice a year. Styles that a popular celebrity or sports hero is wearing are examples of fashion and fad styles. Five types of consumers emerge at each of the life cycle stages. Some popular marketing strategies used to reach each of these consumer types. • Fashion innovators such as fashion designers create or adopt a new product first. They are interested in innovative and unique features. Marketing and promotion should emphasise the newness and distinctive features of the product. This is done by advertising or fashion shows. • Fashion opinion leaders (celebrities, magazines, early adopters) are the next most likely adopters of a fashion product. They copy the fashion innovators and change the product into a popular style. The product is produced by more companies and is sold at more retail outlets. . For example: Designers will copy the recently held Cannes Film Festival’s red carpet dressing and bring it to their respective countries by altering and making it more wearable. • At the peak of its popularity, a fashion product is adopted by the masses. Marketing is through group merchandisers and advertising to broad audiences. • As its popularity fades, the fashion product is often marked for clearance. At this time, bargain hunters and consumers make hey. They are late adopters and laggards. Divya Gupta designer of Yell says, " We design every fortnight and the product life cycle is limited to current season because a product of this summer will not be sold to next summer season. For Example, a product of year 2011 will not be sold out in the next summer season of 2012."